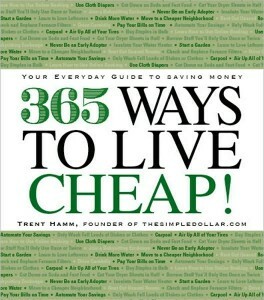 365 Ways To Live Cheap! - A Book ReviewEliminate The Muda! With my recent entry to the world of blogging about personal finance and efficiency I’ve had the pleasure of being exposed to a wide range of new and different perspectives. Frugality is something I never gave much thought to, but it turns out that my Lean Life Management philosophies and frugality have a lot in common. With this recognition I’ve elected to expand my knowledge on the thoughts and lifestyles of the frugal. To that end, one of the books I picked up recently is by Trent Hamm, founder of TheSimpleDollar.com. Titled 365 Ways to Live Cheap: Your Everyday Guide to Saving Money , it comes through on its promise. This book will help show you how to live spending less. Has the recession caught up with you? Are you looking for new or different ways to be frugal? Are you starting your path towards living within you means? If so, this book might be written just for you. #20) Don’t Use The Stove When The Microwave Will Do – For many simple purposes, the microwave oven is much more energy efficient than the stove, often using 75 percent less energy for the same task and adding far less heat to your house. Use your microwave for such tasks as boiling water, steaming and browning vegetables, cooking rice and other water-intensive applications. It can reduce your cooking costs by up to 20 percent. #262) Bypass Agents And Buy Policies Directly From The Companies – If you’re looking to buy your own insurance policies of any kind (life, health, homeowners’, auto and so on), try contacting the insurance company directly via their website instead of dealing with a local agent. Quite often, you get a much better deal by bypassing the agent and his referral fees, though the process for signing up may take longer. #352) Use The “Peak-End” Rule – One particular trait of human psychology is known as the “peak-end” rule. Our memories of something are defined by the peak of that experience and also the end of that experience. In other words, when you think back to your vacation in a year or two, you’ll likely just remember the best thing you did and the very last thing you did, along with a few other scattered bits. So when you plan your vacation, instead of jamming each day with amazing things, just plan one peak experience, the real center piece of your trip, and one great experience near the end of the trip, perhaps on the next-to-last or last day. There are still 362 more to get from Trent’s book. He covers everything from appliances to energy, banking to groceries. Trent even has a section for cheap things to do with the kids. However, probably the most enlightening component Trent provides is a quiz at the beginning of the book called: Where Does Your Money Really Go – It helps you recognize how in tune or not you are with your money. Pick up a copy today. It’s only $7.95, you will earn your money back with just a few tips from his book. If you would like to learn more about living frugally from Trent, check out his blog www.thesimpledollar.com.